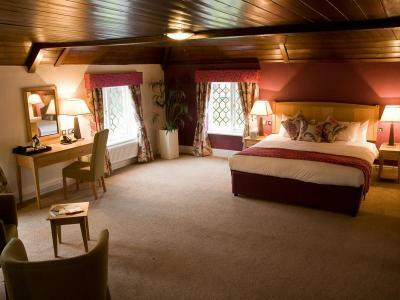 The Barns Hotel has one of the best locations in the Bedford area, on the banks of the picturesque River Great Ouse. 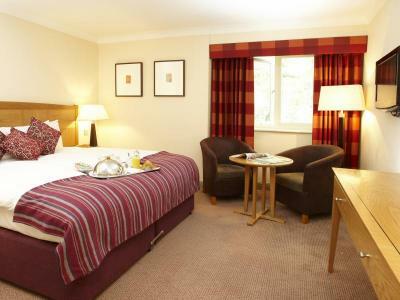 The hotel has a tranquil setting in landscaped gardens, with river and country park views, two miles from Bedford town centre. The WineGlass Restaurant at Barns Hotel serves delicious food and looks out onto the river, offering al fresco dining on the riverside terrace in the summer. Hotel guests enjoy complimentary access to the Oasis Beach Pool and Oasis fitness centre nearby. Samuel Whitbread, of brewing fame, was born in the main house in 1720, when it was privately owned by the Whitbread family. Wake up inspired. Wake up with Classic British Hotels. Traditionally furnished en suite bedroom offering free Wi-Fi, room safe, complimentary Wi-Fi access, bottle of mineral water, chocolates, tea and coffee making facilities. Traditionally furnished en suite bedroom offering free Wi-F1, power showers in the spacious bathrooms, TV, trouser press, hairdryer and tea and coffee making facilities. 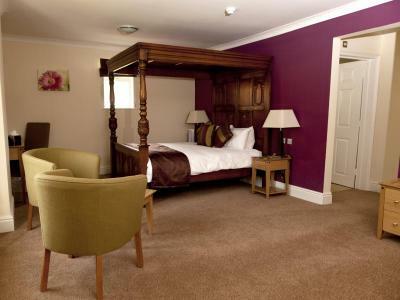 Traditionally furnished en suite bedroom offering free Wi-F, power showers in the spacious bathrooms, TV, trouser press, hairdryer and tea and coffee making facilities. Leave the airport and follow signs for the M1 motorway, signposted 'Way Out, M1, All Routes'. At the roundabout, take the first exit onto the A1081 signposted 'M1, St. Albans'. At the next roundabout, take the second exit onto the M1 SPUR signposted 'London, The North M1'. At the roundabout , take the second exit and join the M1 motorway heading to The North. Leave the M1 at Junction 13. At the roundabout, take the fourth exit onto the A421, signposted Bedford. Continue to follow the A421 for approximately 10 miles, over two roundabouts. At the third roundabout, branch left and take the 1st exit onto the A600, signposted Bedford. At the next roundabout, take the second exit onto Eastcotts Road - B562. At the next roundabout, take the second exit onto the A603. The hotel is on your right hand side. Leave the M1 at Junction 13. At the roundabout, take the 4th exit onto the A421, signposted Bedford. Continue to follow the A421 for approximately 10 miles. At the third roundabout, branch left and take the 1st exit onto the A600, signposted Bedford. At the next roundabout, take the second exit onto Eastcotts Road - B562. At the next roundabout, take the second exit onto the A603. The hotel is on your right hand side. From the High Street, keep in the left hand lanes and continue forward onto the A6. Continue forward at the traffic signals onto Saint John's Street - A6. At the roundabout, take the first exit onto the A5140. At the next roundabout, take the forth exit onto the A603. At the next roundabout, take the third exit onto the A603. At the next roundabout, take the first exit onto the A603. The hotel is on your right hand side. The Wineglass Restaurant is a delightful place to dine, set on the banks of the River Great Ouse with scenic river views. An outdoor terrace offers a great spot to savour a delicious meal, al fresco, at the water's edge. The menu at the Wineglass Restaurant at the Barns Hotel is overseen by Daniel Galmiche, a Michelin starred chef, who worked in conjunction with the head chef at the hotel to create inspired, delicious food, served in a relaxed atmosphere. Over 40 wines are available by the glass, all of them handpicked. 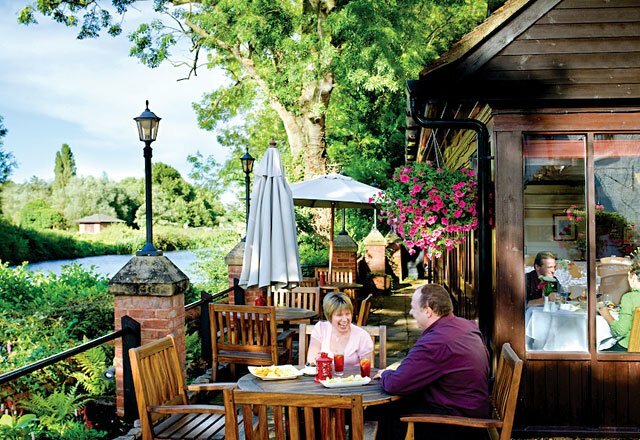 The riverside bar is a wonderful place to unwind on the banks of a pretty river, with views across to a country park. Seating is available both inside and outside. A wide selection of refreshments and bar snacks are available and the riverside terrace makes for a lovely setting in which to enjoy Afternoon Tea or simply watch the world go by. Opens from 11am. Guests at the Barns Hotel are offered complimentary access to the Oasis Beach Pool & Leisure Centre nearby, offering an indoor swimming pool and gymnasium.